At first glance, it may be tempting to dismiss Information Doesn't Want to Be Free: Laws for the Internet Age as a dry, dull account of copyright law as it relates to the Internet. But Cory Doctorow (Little Brother; Makers), coeditor of Boing Boing, is anything but boring, and this is a McSweeney's publication. Doctorow's short little book presents a fascinating and thought-provoking account of the laws, the Web and how the two struggle to coexist. Doctorow structures his argument around three basic rules for understanding--and engaging with--copyright law online. The first rule addresses digital locks, including digital rights management (DRM), while the second moves on to the importance of distribution for achieving fame, and vice versa. The third, which gives the book its title, explores regulations, human rights and censorship. 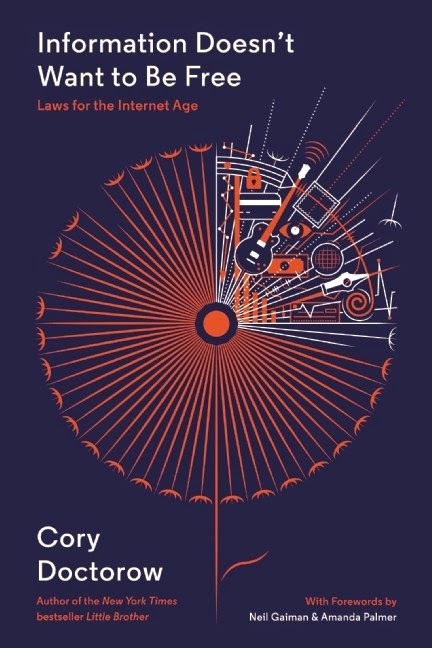 Taken together, Doctorow's rules present a multifaceted approach to understanding these potentially confusing laws, from what motivated governments to pass some of the first copyright regulations to more recent U.S. legislation, such as SOPA, PIPA and net neutrality. Lest the theory behind these laws become too esoteric, Doctorow peppers his work with real-life examples of regulations in action online; lest it become too detailed to be easily understood, he offers analogies that bring the legalese back down to earth. Introductions from Neil Gaiman and Amanda Palmer make an incredible work even more impressive. Information Doesn't Want to Be Free is the most entertaining and informational book on copyright law you'll ever read.